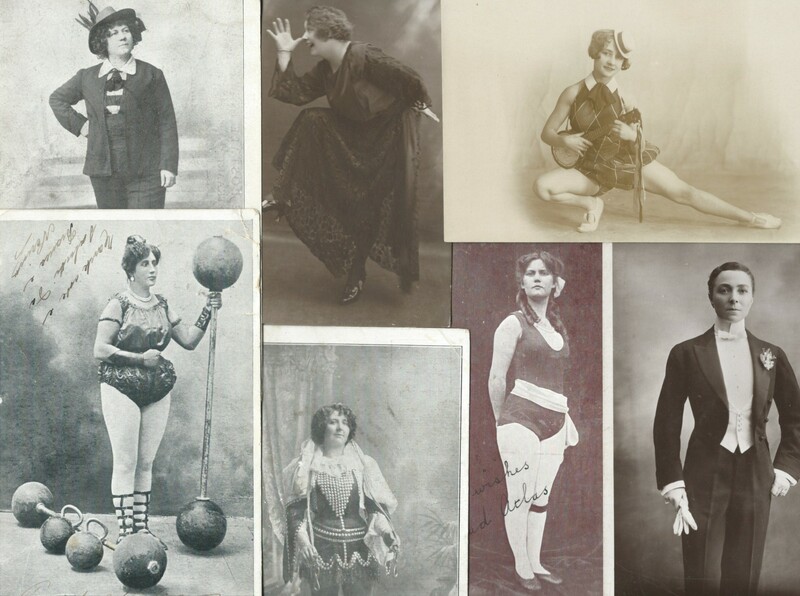 The never-ending search for novelty and excitement meant music halls staged acts that, even today, cause eyebrows to be raised and such is the reaction to the aquatic artistes who travelled country-wide taking with them enormous tanks in which to perform. The days of three or four performances a night in different halls were luckily a thing of the past by the time these performers took the stage. In 1913 at the London Opera House in Kingsway twenty young women disappeared into a lake onstage. They calmly walked forward until they were under the surface of the water. A newspaper of the time tells us that each artiste was supplied with a cup of hot Bovril before and after the performance. Don’t try this at home. I’ve included Miss Sadie, premier lady diver, who appears to be wearing flippers, as I love the photo. 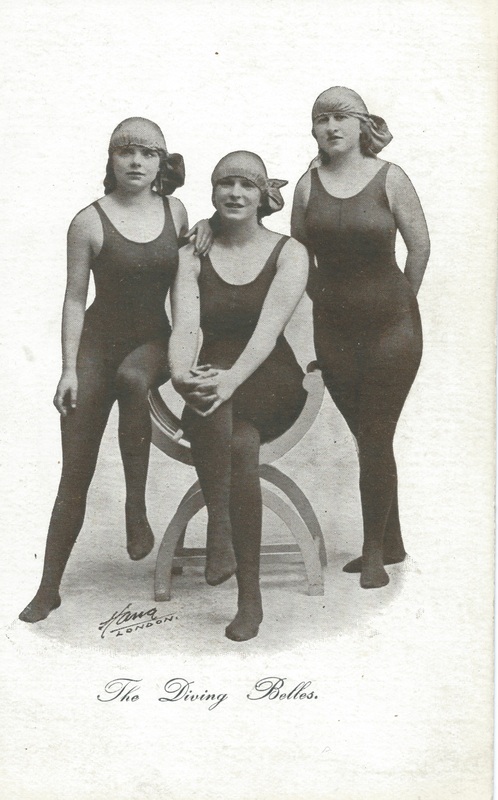 All I’ve been able to find out about her so far is from a New Zealand paper which records she appeared in a film at the Queen’s Theatre, Canterbury diving and performing swimming feats in January, 1913. 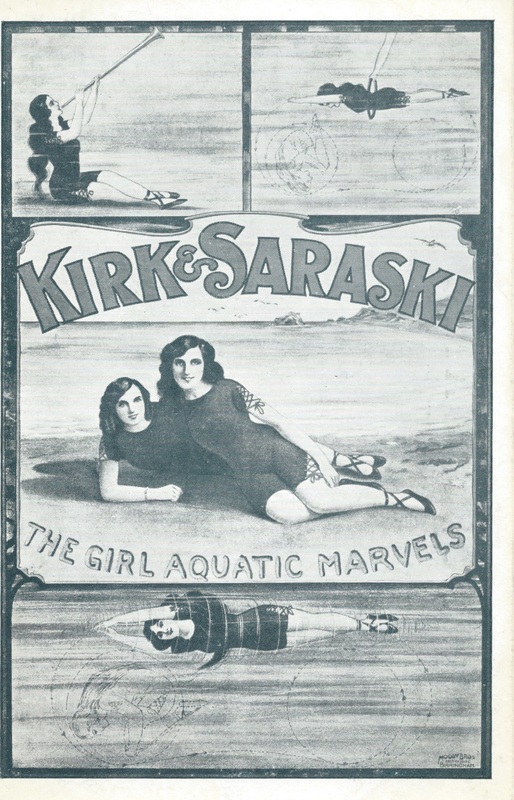 Sisters Kirk and Saraski were described as aquatic acrobats and travelled round the country with their parents performing dives, somersaults and endurance feats under water. One sister held the record for an immersion of 4 minutes 18 seconds and at the King’s Hall, Gloucester, in April 1912 kept underwater for over 3 minutes. In January 1913 Frank Saraski and Anetta Kirk, parents of the performers, brought a court action against Frederick Morley who was the proprietor of the New Palace, Shirebrook. They claimed £17 damages sustained for alleged breach of contract. Morley cancelled the contract at the last minute by telegram but the artistes arrived at Shirebrook and were then unable to find another booking at such short notice. They travelled all over the country to perform and booked for months ahead to minimise train travel and expense. They did not work during the week of the cancelled contract. Mr Morley suggested they went on to Belper but the tank that travelled with them would have been expensive to move and the train timetable would not have allowed enough time for the water in the tank to be heated. The tank and scenery weighed over a ton and in winter it took 8 hours to heat the water to 90 degrees. Morley did not offer Saraski compensation when he arrived at the hall and refused to pay £2 travel expenses. The court found for Mr Saraski and Morley had a judgement made against him for £17. 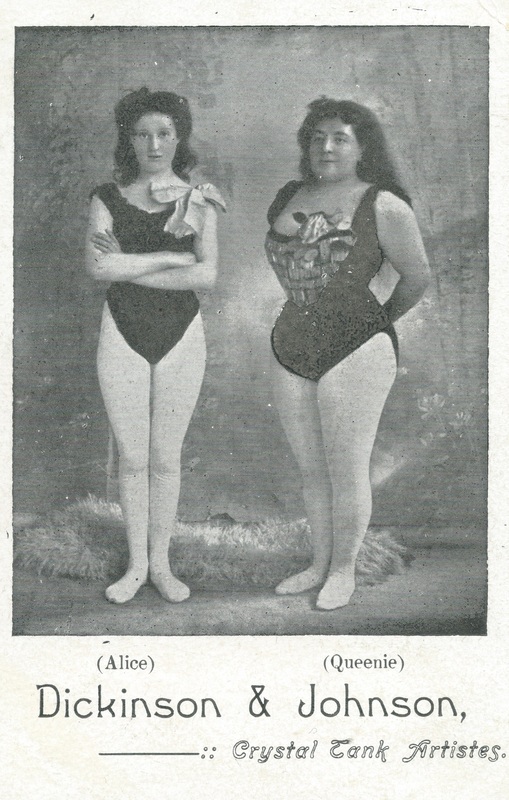 Last but not least are Dickinson and Johnson, Crystal Tank Artistes, who performed around 1899. The stage paper, The Era, mentions their wonderful performances in a small tank of water. Alice Dickinson was often billed as Professor Dickinson and Queenie Johnson billed as Maud but no explanation seems forthcoming. This entry was posted in aquatic acrobats, Crystal Tank, Diving, swimmers and tagged Kirk and Saraski, Miss Sadie on June 25, 2015 by Monomania. How did they heat the water?